Clean, reliable, safe, comfortable and connected - making electric buses a top choice for commute. Electric vehicles and buses are a great way to curb India's pollution problem. But what will make Indians ditch their cars and use the public transportation system for maximum effect? The Indian government has set a target of becoming 100 percent electric in public transport by 2030. Several large auto and bus manufacturers in the world are working on electric vehicles. But, simply replacing diesel buses with electric buses will not be enough to compel people to give up the freedom and privacy of their cars and two-wheelers in favour of public transport. Currently, there are around 40,000 public transport buses operating across India, of which 80 percent operate in the top eight cities. The number of buses is not sufficient for a country of India’s size and has led to the rapid growth of personal vehicles, bringing tremendous traffic congestion and pollution. Public transport needs to be viewed as a desirable experience. It needs to be clean, reliable, safe, comfortable and connected so that it is our top choice for commuting. What we need is not only the electric bus but ‘The Smart Electric Bus’. Imagine yourself in your favourite seat on a quiet, comfortable bus. The temperature is cool while it is hot outside; your handheld devices are well connected to the Wi-Fi. You check real-time schedules of your friend’s bus while you listen to music. You choose to watch a movie or finish your work. You feel safe because there are cameras and sensors monitoring safety. Tranquillity, safety, and efficiency rolled into one – this would be the Smart Electric Bus experience. Club this with last-mile solutions such as e-Rickshaws or e-taxis and the entire journey is comfortable, convenient, connected, and green. This experience could make the switch from our own vehicles to public transport an obvious choice. Now let’s look at how we can get there, and other Frequently Asked Questions (FAQs) about implementing the ‘Smart Electric’ bus concept at scale. Are electric buses being made in India? Yes! Bus manufacturers in India have already launched electric bus models. Some foreign players have also entered the market, but India needs Smart Electric buses made in India for India. Every city in India has different weather, road conditions, operating conditions, and so on. Some imported vehicles are built for long, smooth, wide roads and cooler weather and may not do well in India. Here, we need electric buses of various sizes and features; hence, a platform approach is needed to provide a range of solutions. Are electric buses truly zero emission? Electric buses have zero tailpipe emission, yes. Then the question is ‘are we just reducing road pollution but increasing pollution from power generation plants’? The mix of renewable energy sources for power generation in India is increasing, and renewable power plants already contribute to 31 percent of Indias installed capacity for power generation. Given that this will only increase, the overall pollution impact will reduce. Are electric buses more expensive? Right now, electric buses are more expensive than diesel buses because the lithium-ion batteries used in these vehicles are not manufactured in India and must be imported. Governments across the world including India have programs to initially subsidise the procurement of electric buses to encourage mass adoption. Clubbed with local battery manufacturing and unique financing models, India may not need the subsidy for very long. What is the charging infrastructure for electric buses? Electric buses need infrastructure, regulations and an entire ecosystem. There is substantial effort already ongoing in each of these areas. Key points being addressed for the charging infrastructure are standardising charging station interfaces, regulatory changes to decide on which entities can sell power, defining safety standards, and an entity that can enable the necessary space for installation of charging stations. There are different approaches to charging infrastructure. I am an advocate of ‘Top-up Charging’ -one that starts off with a decent range in the morning and uses multiple short, fast charges during the day so that buses can complete their daily running of 200-225km per day. This kind of charging station needs a small space of 1 meter x 1 meter for installation and can be installed on the route and convenient locations. The objective should be to have more buses with higher frequencies so that passenger convenience is maximised. 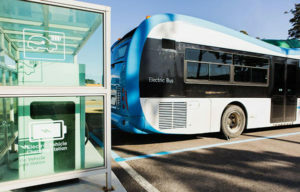 Another method of charging is ‘Battery Swapping’ in which the bus stops at a charging station and gets a new battery and moves on while the old battery is taken out and charged. Battery swapping requires space to warehouse batteries, plus investment in automation to handle heavy batteries. The ‘Smart Electric’ bus is the core of a modern public transport system in India. Overall, smart, sustainable, safe, and comfortable public transportation is the key to addressing the challenges of pollution and congestion, which Indian cities face today. This smart electric bus is likely to encourage people to leave their cars and bikes at home and thus make cities greener. It could change the way Indians commute and the quality of air Indians breathe.